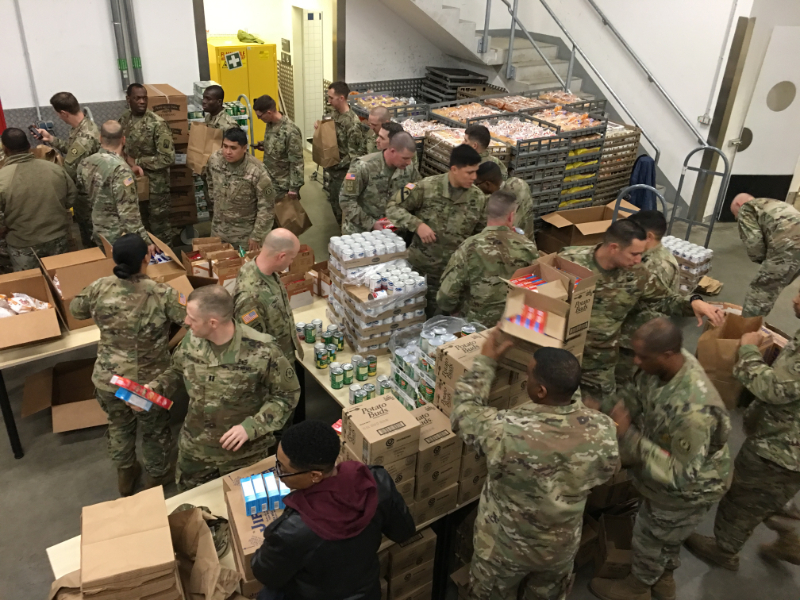 GRAFENWOEHR, Germany — The Grafenwoehr USO partnered with the Grafenwoehr Commissary in U.S. Army Garrison Bavaria’s first Thanks for Thanksgiving event to provide service members and their families baskets full of all the necessities for a proper Thanksgiving meal. In total, the organizations provided Thanksgiving baskets to 246 selected Soldiers and families. Each one included a turkey with all the fixings and a pie. More than 100 volunteers prepared the Thanksgiving packages for the junior-enlisted Soldiers. Preparations started very early on the Saturday before Thanksgiving. The Grafenwoehr Commissary warehouse was crowded with volunteers preparing baskets. Soldiers and families from Better Opportunities for Single Soldiers, the USO and tenant units lined up in multiple assembly lines to help. Vicky Mills, the Grafenwoehr Commissary officer, supported this event at USAG Bavaria, having already supported the program at Kaiserslautern, her last duty station. “Thanks for Thanksgiving is exactly what it is. It’s a way to give back to the soldiers,” Mills said. Mills asked six industry partners to donate for the program. All of them were willing to provide enough groceries to fill the baskets. After about two hours of busy preparations, the young soldiers were invited to pickup their baskets. USO and senior spouses also provided coffee and snacks for everyone. “We are all so thankful for the service of these service members and their families. I sleep at night safely in my bed because of what they do,” said Carly Harris, director of the USO Bavaria Area.